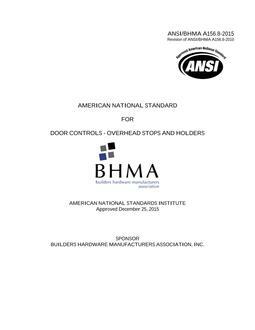 This Standard establishes requirements for thresholds. Types are described with identifying numbers. Strength tests, fastening systems, and gasketing tests are included. Tests described or referenced in this Standard are performed under laboratory conditions. In actual use, results vary because of installation, maintenance, and environmental conditions. This item is available as part of a discounted standards set covering Trimming of Doors .